Peanuts characters are breaking out of their two-dimensional world! No, I am not talking about the fact that the upcoming CGI Peanuts movie is going to give the Snoopy and the gang depth perception. 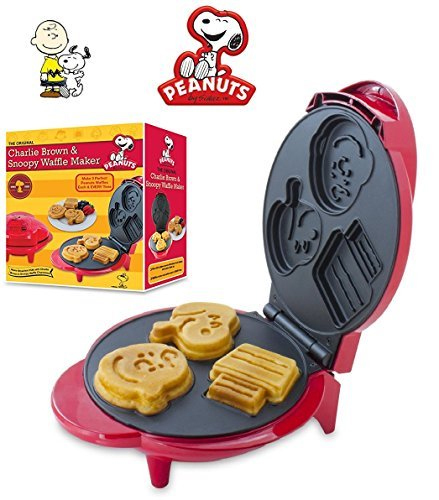 This is a kitchen blog, so I’m talking about the Peanuts Snoopy & Charlie Brown Character Waffle Maker . Specifically, big, fluffy waffles made to look like Charlie Brown, Snoopy and Snoopy’s Sopwith Camel, err, dog house. The “Peanuts” movie doesn’t come out until next year, so meanwhile, kick back with some waffles. Don’t forget to share with the Little Red-Haired Girl.